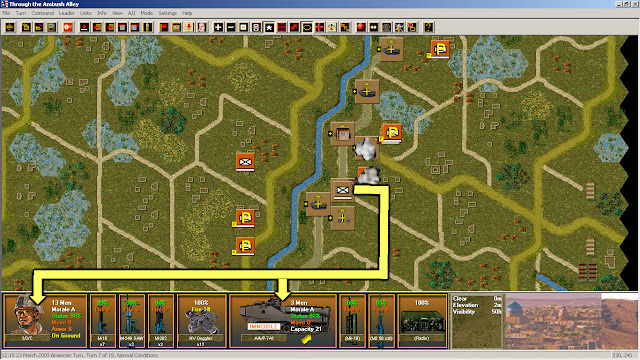 The enemy pressure increases as the objective nears. Another mobility loss, this time I'm sure from an enemy RPG. No crew casualties and the Marine squad disembarks from the vehicle under the cover of smoke. The convoy is starting to loose cohesion and order. 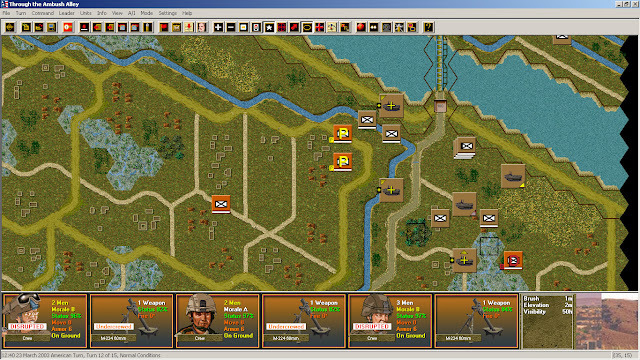 Besides the mix up of different platoons, more vehicles get delayed to suppress and destroy by fire enemy units, which become more bold and tenacious as the Marines approach the Saddam Canal bridge. Although the scenario didn't feature some of the bizarre tactical practices of the Iraqi irregulars described in the book (like driving a couple of buses full of personnel across the Marines' route) the increase in enemy fire is very evident. 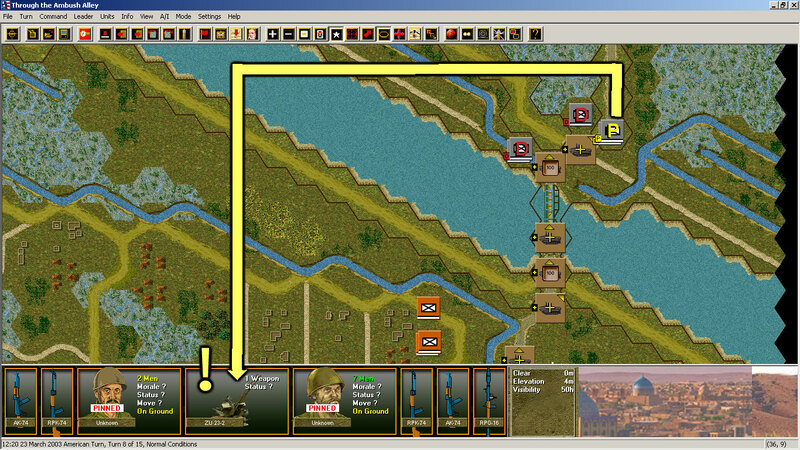 Practically ignoring multiple enemy threats, my AAVs rush towards the Saddam Canal crossing. 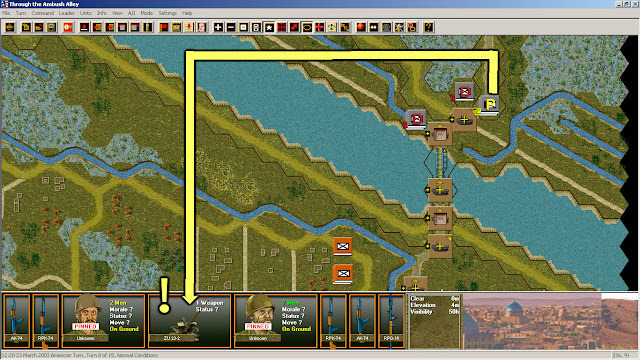 Iraqi Army dismounts (grey counters) are waiting on the other side of the canal. The Iraqi Army had a nasty surprise for my Marines: an anti aircraft gun. 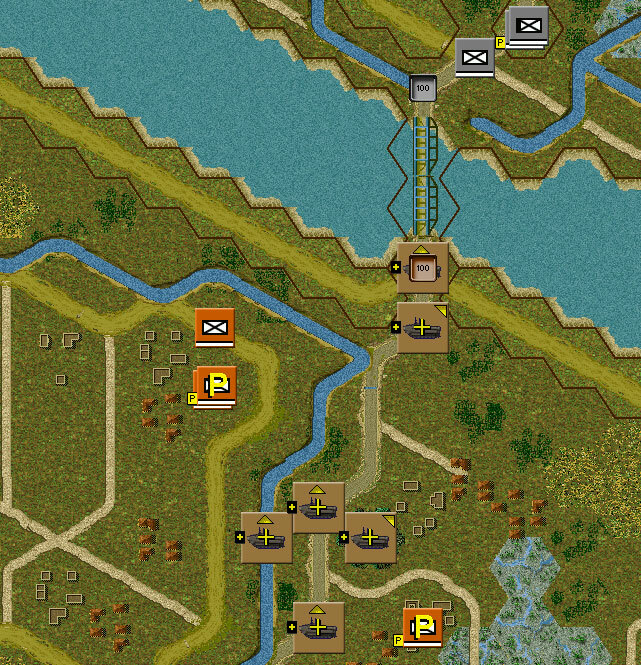 This piece of hardware can cause some serious damage to my thinly armored AAVs, but the combined fires of units across and crossing the bridge is too much for the defenders. Note the "D" (stands for demoralized) labels in the Iraqi infantry. That ZU-23 anti-aircraft gun ... I don't think it is accounted for in the book (?). The bridgehead on the north side of the canal is expanded. Most Iraqi casualties are caused by fires from the AAVs. One technical truck showed up (counter labelled with a red X) and was dispatched without causing even the slightest concern to us. Based on what I read in the book, I was expecting the battle to be particularly nasty north of the canal. Indirect and direct fire ... the works. 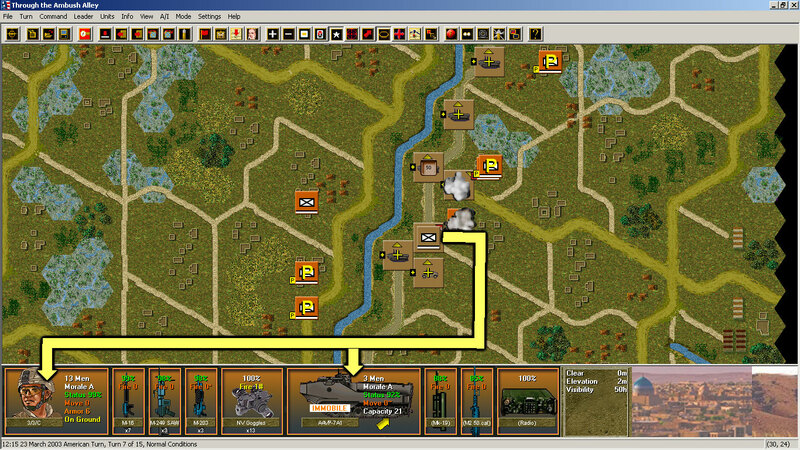 I wanted to avoid having my Marines deployed in a thin line up to the main road (as shown in the highly detailed diagram of page 207, see book). 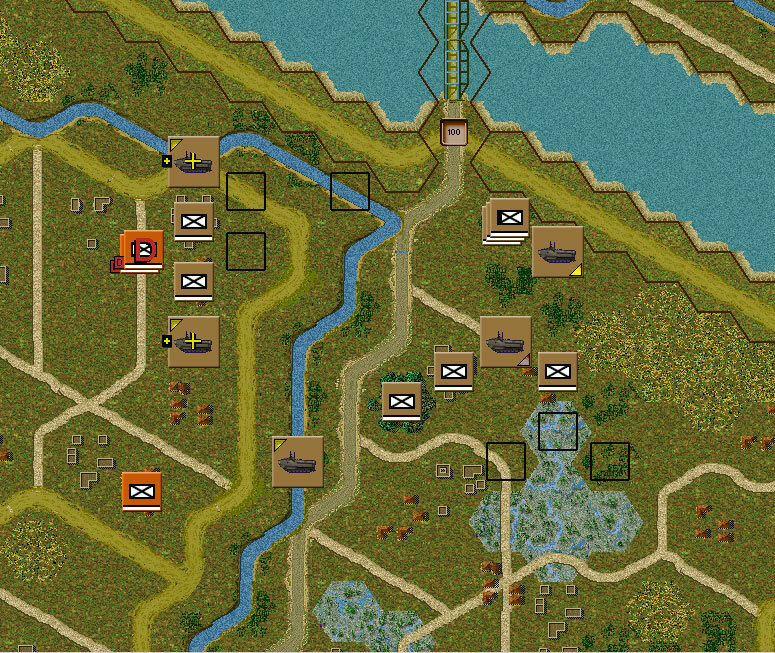 However, fresh enemy units didn't show up in the game scenario. 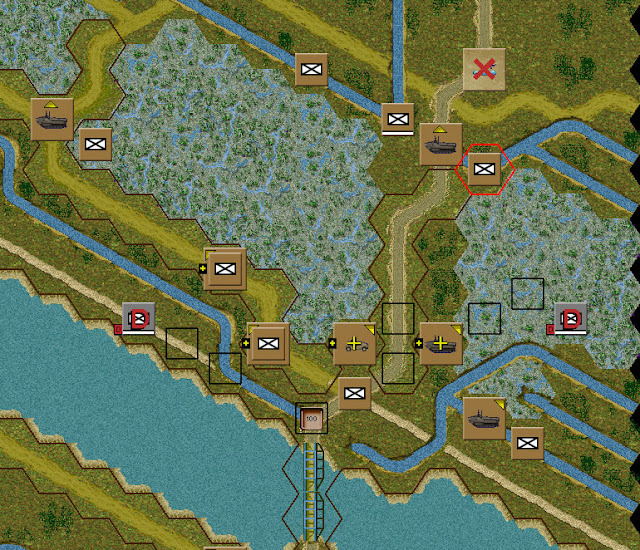 All the bridgehead deployment in the screenshot above, fanned out, with reserves in the middle proved to be a waste of resources. It was just a mop up of the remaining Iraqi Army infantry. South of the canal is where most of the action was happening. 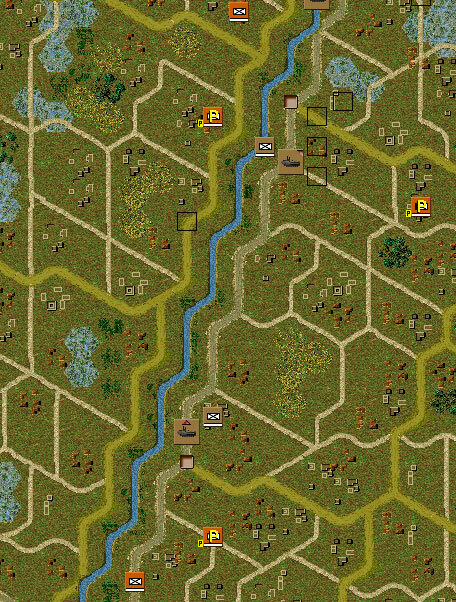 I was lucky that the bridgehead north was in good shape, because the situation down here was worrying to the point where I had to rush the deployment of my heavy weapons platoon. 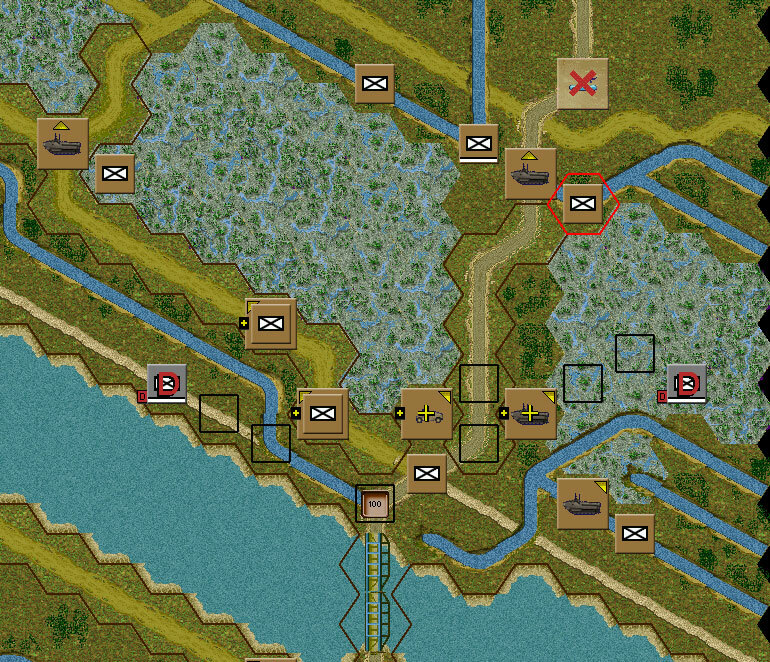 The mortar section (counter stack east from the main road, south from the canal) suffered two casualties while disembarking (I didn't use a smoke screen and I deployed them in a far too exposed location). The MG section (west from the main road, south from the canal) was put on foot too and suffered one casualty while moving into position. The disembark and deployment of my heavy weapons was sloppy and hasty. In the screenshot above, you can also see two Marine squads (south from the mortar section stack) on the move. These guys had to save the day by close-assaulting enemy units targeting the mortar crews. One Marine casualty was suffered during one of those multiple assaults. There was also an additional mobility loss of an AAV that was providing fire support (AAV counter with a redish chevron, directly south from the mortar stack). By the scenario end, the southern extreme of the bridge is secure. Note how the Marine units have expanded their advance westwards. Let's not forget those two Marine squads that were left along their immobilized AAVs. They managed to fend off repeated attempts by enemy units to close in for an assault. The guns of the immobile AAVs were crucial in this outcome. The Marine squad on the north suffered one casualty while moving into a position with a better field of fire. Victory screen. Objectives secured, 5 casualties, 3 mobility losses. The real battle was way more bloody and nerve-wracking for the Marines. 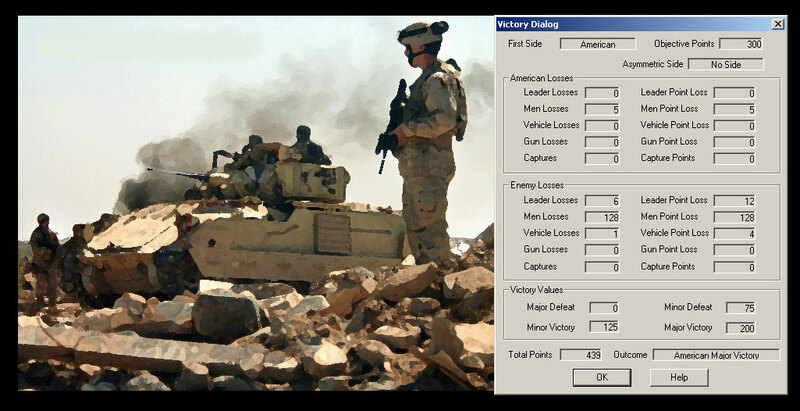 Catastrophic losses of vehicles to to enemy and friendly fire (close air support), Marines stranded south of the bridge barely fending off close assaults by Iraqi irregulars, intensive enemy fire (both direct and indirect) upon the bridgehead ... A hard won battle. Although the overall tactical tone of the scenario matches the real battle, the former felt a bit too forgiving, even for this green Squad Battles player. J, sounds like you were let down at the end with the scenario not living up to the actual events. Would be interesting to see this played out in CMSF as a comparison. I was expecting more resistance. It was a total cake walk. I've lost my copy of CMSF to that Battlefront's DRM. I'm not sure if I have the time to deal with it all over again.